Based on the novel by Jacquelyn Mithard, a three-year-old boy is lost in a hotel lobby. Ten years later he returns to the parents he doesn't remember. 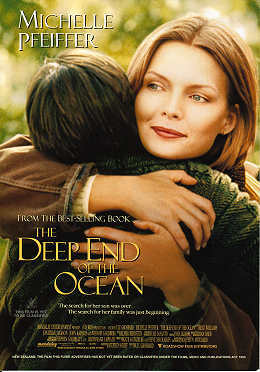 with Michelle Pfeiffer as the mother, Treat Williams, and Whoopi Goldberg as the detective. It's a little reminiscent of Frantic - Michelle Pfeiffer's character Beth Cappadora pushes through a crowded hotel lobby, briefly leaving her two young sons Vincent (Cory Buck) and Ben (Michael McElroy) alone with the luggage. When she returns, Ben is gone. What seems a brief worry turns into major trauma as the months go by without any trace of the child. Then, nine years later, Ben turns up on their doorstep - only now he's Sam (Ryan Merriman), a kid from two blocks away who has no memory of his original family and has knocked on the door to offer to mow the lawn. The family's emotional pain is renewed as they try to integrate Ben back into their lives. It's a powerful plot, which is why this film's treatment of it is so disappointing. In full Hollywood style, it's emotionally over-manipulative, pushing all the right buttons and but distancing the audience from any truth in its plot. Pfeiffer and her fellow actors don't really have their hearts in it- there's a lot of moist eyes and chest-beating but you learn little about what it really feels like to go through their crisis. It doesn't help that the family is so stereotypically white bread, pure middle-class suburbia with three kids and a nice home. If the characters were allowed to be more distinctive, it would seem more real. The one attempt to balance their blandness, a gay black female cop called Candy Bliss (Whoopi Goldberg) seems tokenistic; she does little but pop up from time to time to offer a sympathetic ear. The material is good but the execution is lacking in real emotional punch, likening it to that class of telemovies featuring plucky families battling against the odds. Best left for video on a rainy Sunday afternoon.